Автор(ы): Edwards M.A., Govers R., van Hinsbergen D.J.J. Издание: The Geological Society, London, 2009 г., 373 стр. Настоящий сборник включает в себя 13 работ, в которых рассматриваются различные вопросы геодинамики, стратиграфии, истории геологического развития, магматизма, метаморфизма, кинематики региона, находящегося на стыке Африки, Саудовской Аравии и восточной Европы с позиций тектоники плит, т.е. как зоны субдукции и связанной с ней орогении. The Society makes every effort to ensure that the scientific and production quality of its books matches that of its journals. Since 1997, all book proposals have been refereed by specialist reviewers as well as by the Society’s Books Editorial Committee. If the referees identify weaknesses in the proposal, these must be addressed before the proposal is accepted. Once the book is accepted, the Society Book Editors ensure that the volume editors follow strict guidelines on refereeing and quality control. We insist that individual papers can only be accepted after satisfactory review by two independent referees. The questions on the review forms are similar to those for Journal of the Geological Society. The referees’ forms and comments must be available to the Society’s Book Editors on request. Although many of the books result from meetings, the editors are expected to commission papers that were not presented at the meeting to ensure that the book provides a balanced coverage of the subject. Being accepted for presentation at the meeting does not guarantee inclusion in the book. 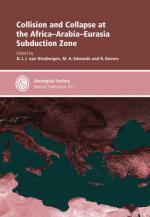 More information about submitting a proposal and producing a book for the Society can be found on its web site: www.geolsoc.org.uk. Издание: Economic geology, 1988 г., 23 стр. 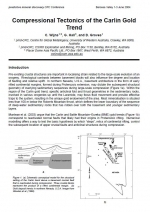 This comparative geochemical study of jasperoid in the northern Great Basin is based on 65 samples from 10 Carlin-type gold deposits and 22 similar but apparently barren hydro-thermal systems. Multielement geochemistry coupled with oxygen isotope data indicate that hydrothermal fluids in barren and mineralized systems evolved in different ways, and that there are fundamental geochemical differences among the various gold-producing deposits of the area. Much of the variation in the jasperoid geochemical data can be explained in terms of seven abstract end-member components obtained through factor analysis. Three of these components (factors) dominate the results and are related to common products of alteration and mineralization in epithermal systems of the northern Great Basin. Element associations for these factors are: factor 1: Ti02, Al203, La, K20, Sr, Fe203, Th; factor 2: Au, Ag, Sb, Si02> As, Pb; and factor 3: W, B, V, Zn, Co, Au, CaO, Ni, Mn, Cu. Издание: Economic geology, 1989 г., 3 стр. 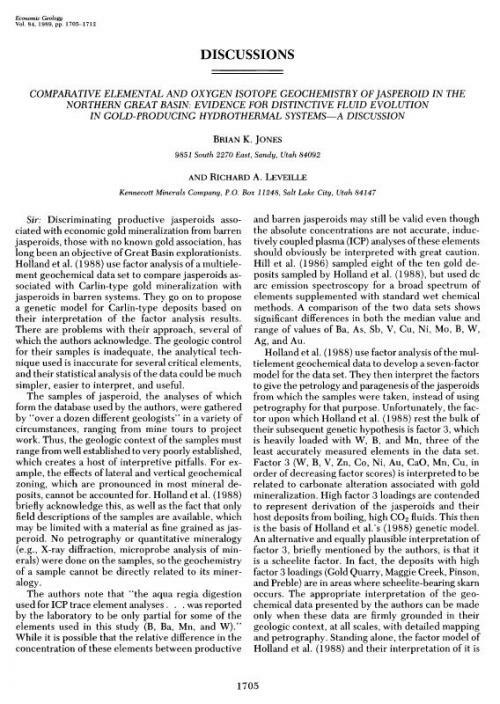 Discriminating productive jasperoids associated with economic gold mineralization from barren jasperoids, those with no known gold association, has long been an objective of Great Basin explorationists. Holland et al. 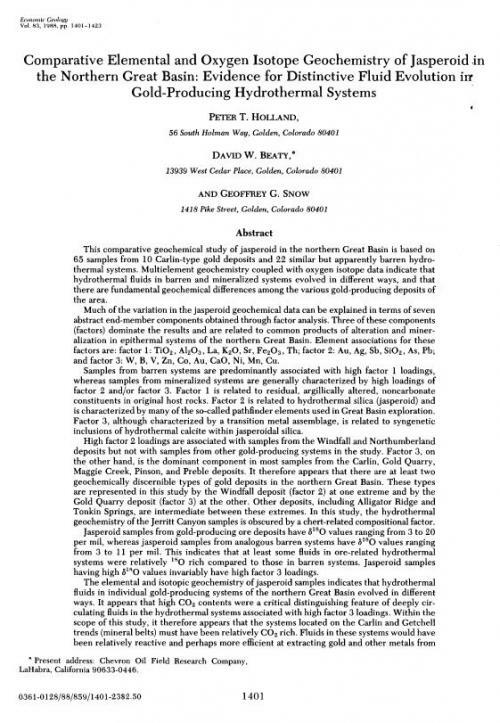 (1988) use factor analysis of a multielement geochemical data set to compare jasperoids associated with Carlin-type gold mineralization with jasperoids in barren systems. They go on to propose a genetic model for Carlin-type deposits based on their interpretation of the factor analysis results. 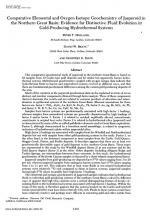 There are problems with their approach, several of which the authors acknowledge. 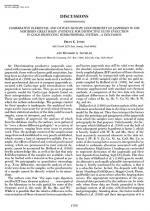 The geologic control for their samples is inadequate, the analytical technique used is inaccurate for several critical elements, and their statistical analysis of the data could be much simpler, easier to interpret, and useful. Издание: Economic geology, 1989 г., 6 стр. 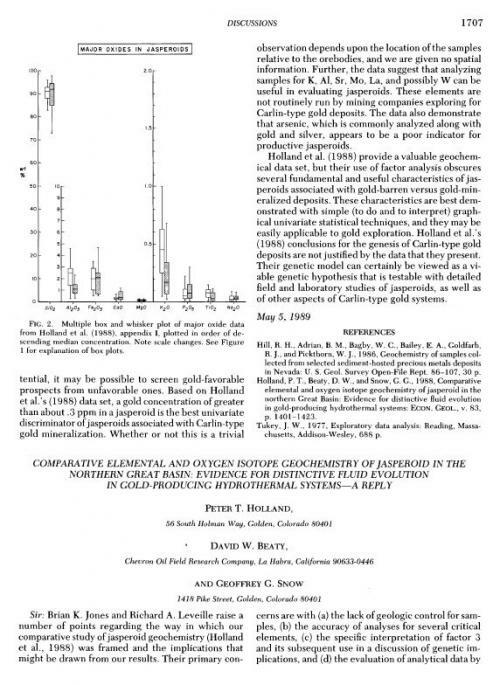 Brian K. Jones and Richard A. Leveille raise a number of points regarding the way in which our comparative study of jasperoid geochemistry (Holland et al., 1988) was framed and the implications that might be drawn from our results. Their primary concerns are with (a) the lack of geologic control for samples, (b) the accuracy of analyses for several critical elements, (c) the specific interpretation of factor 3 and its subsequent use in a discussion of genetic implications, and (d) the evaluation of analytical data by means of Q-mode factor analysis. We will address each of these concerns in turn. Издание: Elsevier, 1993 г., 11 стр. 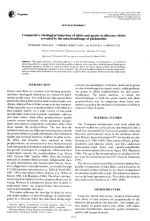 This paper presents a detailed comparison of the microboudinage of piedmontite in two different mineralogical hosts, a quartz matrix, and albite porphyroblasts in a siliceous schist, with the aim of clarifying the rheological properties of albite in relation to those of quartz. Stress and strain analyses of the microboudinage confirm that the boudinage took place in the retrograde stage of metamorphism during decreasing temperature, and reveal that albite deformed at the same strain rate as quartz above the plastic-brittle transition temperature of albite. Издание: PGS Publishing, Linden Park, 2002 г., 6 стр. Proterozoic hydrothermal iron oxide deposits occur within two metallogenic belts in the northeastern U.S.: the Adirondack region, and the Mid-Atlantic (Reading Prong) belt. 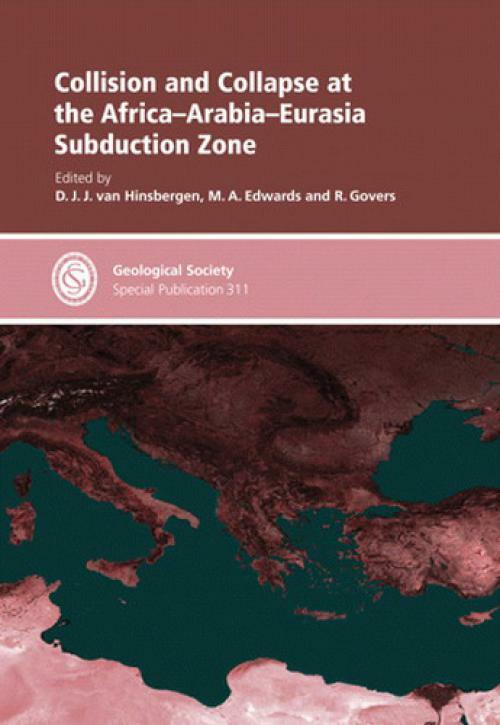 A 175 km wide belt of Palaeozoic cover separates these two regions, although some iron deposits occur in Proterozoic rocks near the unconformity, suggesting a possible continuation beneath the cover. Although potentially part of the same continuous metallogenic province sharing similar mineralogy, host rock composition and hydrothermal alteration, deposits in the two regions differ in degree of deformation. Differences in the degree of metamorphic deformation fuel the debate of the relative timing of mineralisation, igneous activity, and metamorphism. Generally less deformed textures in the Adirondack deposits led workers in the New York deposits to conclude iron ores in the Adirondacks are associated with anorogenic granites that postdate peak metamorphism. Folded iron ores in granitic gneiss of the Mid-Atlantic belt suggest some deposits in eastern Pennsylvania, northern New Jersey, and southern New York predate peak metamorphism. REE-enriched deposits in both belts are characterised by abundant apatite, tourmaline, and manganese concentrations, as well as the presence of hematite-chlorite alteration in addition to magnetite. Unlike deposits hosted exclusively within granite gneisses, deposits within supracrustal rocks commonly contain significant sulphides and so are potential hosts for copper mineralisation. 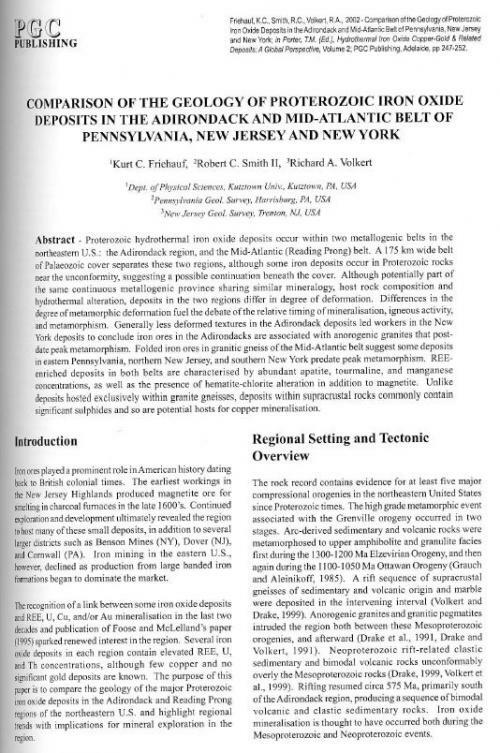 Автор(ы): Juvonen R., Kontas E.
Издание: Journal of Geochemical Exploration, 1999 г., 11 стр. 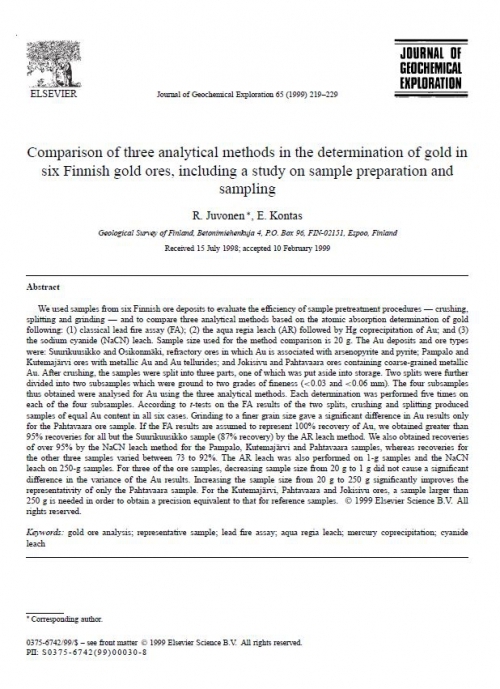 We used samples from six Finnish ore deposits to evaluate the efficiency of sample pretreatment procedures — crushing, splitting and grinding — and to compare three analytical methods based on the atomic absorption determination of gold following: (1) classical lead fire assay (FA); (2) the aqua regia leach (AR) followed by Hg coprecipitation of Au; and (3) the sodium cyanide (NaCN) leach. Sample size used for the method comparison is 20 g. The Au deposits and ore types were: Suurikuusikko and Osikonma¨ki, refractory ores in which Au is associated with arsenopyrite and pyrite; Pampalo and Kutemaja¨rvi ores with metallic Au and Au tellurides; and Jokisivu and Pahtavaara ores containing coarse-grained metallic Au. After crushing, the samples were split into three parts, one of which was put aside into storage. Two splits were further divided into two subsamples which were ground to two grades of fineness (<0.03 and <0.06 mm). 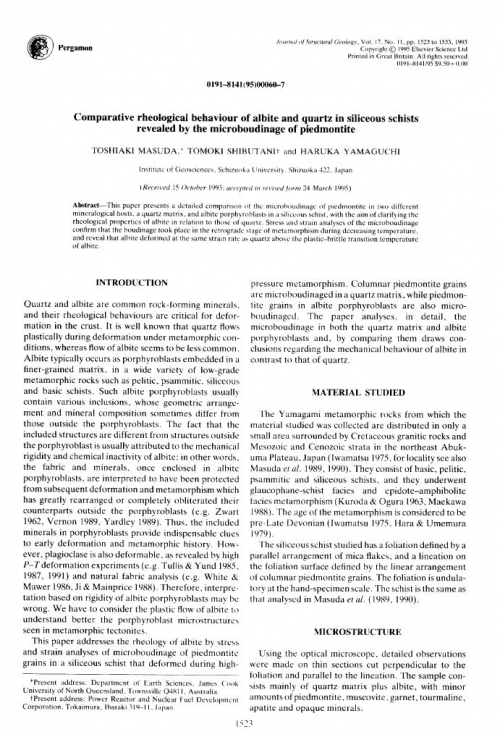 The four subsamples thus obtained were analysed for Au using the three analytical methods. Each determination was performed five times on each of the four subsamples. According to t-tests on the FA results of the two splits, crushing and splitting produced samples of equal Au content in all six cases. Grinding to a finer grain size gave a significant difference in Au results only for the Pahtavaara ore sample. If the FA results are assumed to represent 100% recovery of Au, we obtained greater than 95% recoveries for all but the Suurikuusikko sample (87% recovery) by the AR leach method. We also obtained recoveries of over 95% by the NaCN leach method for the Pampalo, Kutemaja¨rvi and Pahtavaara samples, whereas recoveries for the other three samples varied between 73 to 92%. The AR leach was also performed on 1-g samples and the NaCN leach on 250-g samples. For three of the ore samples, decreasing sample size from 20 g to 1 g did not cause a significant difference in the variance of the Au results. Increasing the sample size from 20 g to 250 g significantly improves the representativity of only the Pahtavaara sample. For the Kutemaja¨rvi, Pahtavaara and Jokisivu ores, a sample larger than 250 g is needed in order to obtain a precision equivalent to that for reference samples. Автор(ы): Buslov M.M., Vovna G.M. Издание: Journal Geochemistry International, 2008 г., 10 стр. 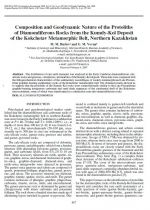 The distribution of rare earth elements was analyzed in the Early Cambrian diamondiferous calcsilicate rocks and gneisses, calciphyres, and marbles of the Kumdy-Kol deposit. These data were compared with the lithogeochemical characteristics of the sedimentary assemblages of weakly metamorphosed Late Precambrian graphite-bearing sedimentary rocks of the Kokchetav metamorphic belt. 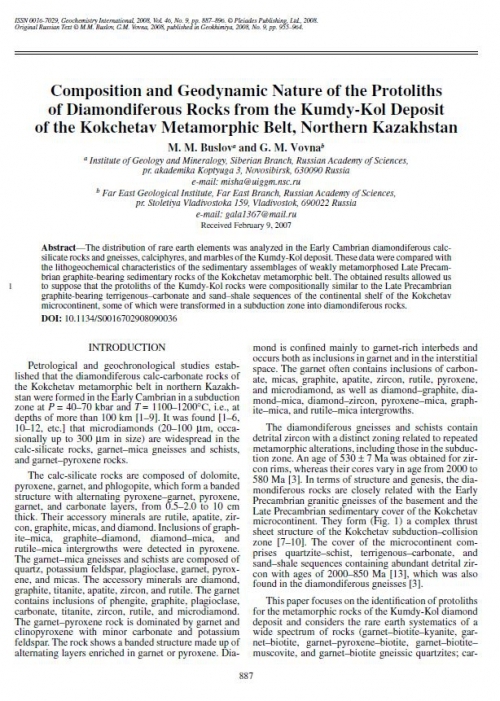 The obtained results allowed us to suppose that the protoliths of the Kumdy-Kol rocks were compositionally similar to the Late Precambrian graphite-bearing terrigenous–carbonate and sand–shale sequences of the continental shelf of the Kokchetav microcontinent, some of which were transformed in a subduction zone into diamondiferous rocks. Автор(ы): Groves D., Hall G., Wijns C.
Издание: Barossa Valley, 2004 г., 4 стр. Pre-existing crustal structures are important in localising strain related to the large-scale evolution of an orogeny. Rheological contrasts between basement blocks will also influence the degree and location of faulting and relative uplift. In northern Nevada, U.S.A., basement architecture in the form of early rifted continental margins, formed during Proterozoic extension, may dictate the subsequent structural geometry of overlying sedimentary sequences during large-scale compression (Figure 1a). Within the region of the Carlin gold trend, specific anticlinal fold and thrust geometries in the sedimentary rocks, involved in various orogenies up until the Laramide, may focus fluid movement and provide effective traps to the system, resulting in the unique gold endowment of the area. Most mineralisation is situated less than 100 m below the Roberts Mountain thrust, which defines the lower boundary of the sequence of deep-water sedimentary rocks that has ridden over both the basement and younger sedimentary layers. Muntean et al. 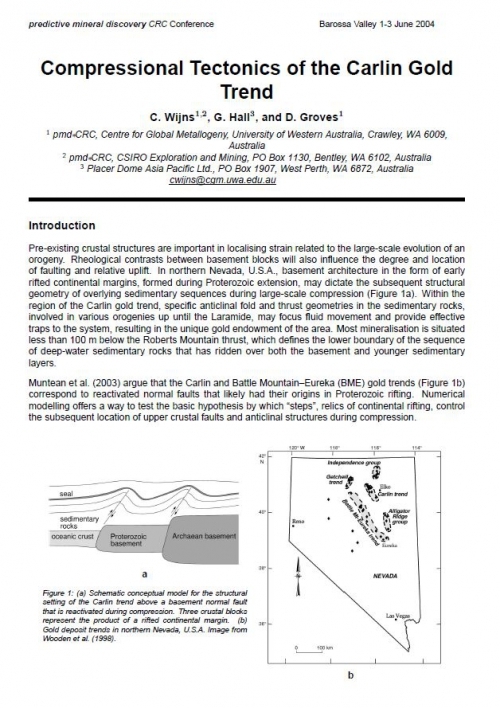 (2003) argue that the Carlin and Battle Mountain–Eureka (BME) gold trends (Figure 1b) correspond to reactivated normal faults that likely had their origins in Proterozoic rifting. Numerical modelling offers a way to test the basic hypothesis by which “steps”, relics of continental rifting, control the subsequent location of upper crustal faults and anticlinal structures during compression. 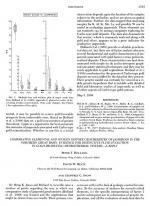 Автор(ы): Shengyong Y., Xuejing X., Xueqiu W.
Издание: Journal of Geochemical Exploration, 1995 г., 9 стр. Conventionally, geochemical exploration for gold is based on the assumptions that (1) gold is chemically inert in surficial environments; (2) gold occurs mainly in discrete grains; and (3) gold is transferred by mechanical means to form clastic dispersion halos and dispersion trains. 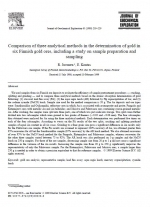 Consequently, the commonly adopted methodology has been (1) to determine gold in heavy mineral concentrates; (2) to use large samples in order to improve the reproducibility of gold analyses; (3) to use high detection limits and thresholds; and (4) to determine total gold contents and pathfinder elements in the samples. However, these methods are not always successful in locating gold deposits, and they have limited application in the search for buried or blind deposits. 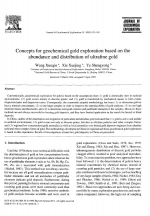 In China, studies of the distribution and migration of particulate and ultrafine gold indicated that (1) gold is active and mobile in surficial environments; (2) gold occurs not only as discrete grains, but also as ultrafine particles and other complex forms; and (3) regional low-concentration gold anomalies as well as local anomalies over buried gold deposits originate from ultrafine gold and other complex forms of gold. 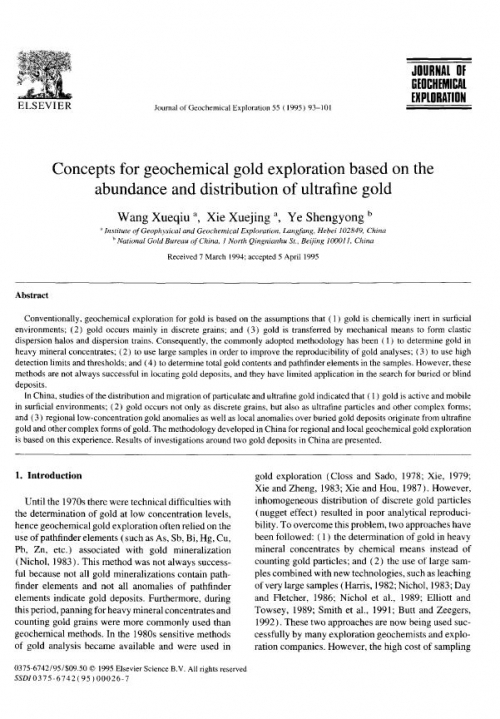 The methodology developed in China for regional and local geochemical gold exploration is based on this experience. Results of investigations around two gold deposits in China are presented.